The spur-of-the-moment invitation was all the more delicious because Doug and I hadn’t planned anything for dinner that evening. And the cozy company of longtime friends was exactly what we needed in the middle of a crazy-busy week. It turned out to be a perfect evening. That night, we also revisited an earlier conversation we’d started on the topic of entertaining. We all admitted that, in the past, we often avoided inviting friends for dinner because we thought a meal for “company” had to be fancy or labor-intensive. Which is silly, of course, but it was an easy excuse to make when we were too busy or too lazy to break bread at home with friends. Along the same lines, anyone who reads gourmet cooking magazines on a regular basis will admit to feeling intimidated sometimes, even by featured recipes described as easy or simple. If throwing a dinner party requires performing a culinary miracle, well, we’re not likely to host very often. One of the great gifts of midlife is that you start getting over these things. You realize that “the good life” is what’s real — not a page out of a glossy magazine. You remember that your true friends love you just as you are, and that any dish that’s good enough to serve your family is good enough for them, whether it’s your favorite mac and cheese or turkey chili. Not that foodies shouldn’t have some creative fun in the kitchen. One of my New Year’s resolutions is to master a few healthy recipes that work for company as easily as for the two of us. For instance, in the March issue of Prevention, I found “All-American Family Favorites,” a feature that includes several no-fuss, kid-friendly dishes that can be prepared in no time at all. 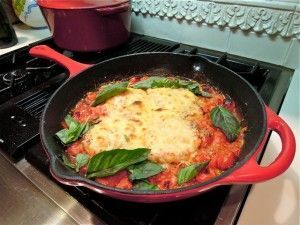 The Skillet Chicken “Parm” looked fabulous, so Doug and I put the recipe to the test after shopping for a few items at the local market. The ingredients are as basic as you can get: chicken breasts, cherry tomatoes, garlic, olive oil, mozzarella cheese, and fresh basil. I’m very happy to report that the meal was both easy and delicious — and perfect for casual dinner guests. Topping it off, our own red skillet looked so colorful with the basil garnish that I had to share my photo with you. (I don’t have the rights to reprint the recipe, so you’ll have to pick up the March issue of Prevention, still available on newsstands.) From now on, I’ll be on the lookout for more recipes like this. In another inspiring book, creativity expert Julia Cameron ponders all facets of the artful life, from enduring fallow time to savoring epiphanies and breakthroughs. 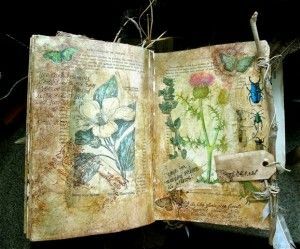 Drawing from the rich well of her own experiences, Cameron reminds us in The Creative Life that we must take time out to reassess where our paths are leading us. If we’re blocked, it helps to “vent” with a trusted creative friend, as Cameron suggests. While venting, we might discover that all we need is a short break or more sleep. Or that it might be time to head off in a new direction. I’m lucky to have an artist-architect husband and several writer-friends with whom I can share my creative dreams and disappointments. When I indulge in a little creative venting, I often discover why I’m blocked — or how to push beyond my so-called limits. Sometimes, too, my professional concerns or worries are validated. For instance, my writer-friends are the first to point out when an editor is treating me unfairly — or when I’ve missed the mark. Traditionally, some Christian churches ask us to forfeit something we enjoy for the duration of the Lenten season. We might choose to give up alcohol, potato chips, peanut butter, shoes shopping, ice cream, favorite TV shows (or, heaven forbid, dark chocolate truffles) while we prepare for “rebirth” on Easter Sunday. I wont argue with any of that — and I’m not incapable of postponing pleasure when the occasion calls for it. Truth is, I find that chocolate, one of my diehard addictions and pleasures, is so much easier to surrender than a genuine bad habit. Over the years I’ve come to view Lent as a fresh opportunity for serious soul-searching. I love the idea of escaping to a metaphorical desert for 40 days to review and purge my bad habits; to strip away the stubborn layers of outworn grievances. (Not that I’ve been entirely successful in previous attempts.) All said and done, I try to use the whole Lenten season as an extended spa for the spirit; a reflective retreat. *Caring (too much) about what other people think. *Believing that it’s my role in life to keep everyone happy all the time — even when Im exhausted or over-extended. *Believing I must achieve something big in order to make a difference or have value as a human being. *Taking the key players in my life for granted while fussing over others who don’t deserve as much attention. *Buying more black clothing than I can possibly wear. *Worrying about things I cant possibly fix or control, including my mothers dementia. *Assuming that the most expensive product is always superior. *Feeling guilty if I’m not “productive” all the time. *Allowing the beauty, fashion, and cosmetic industries to make me feel ashamed about aging and looking older. *Wasting time on the computer when I could use a walk and fresh air. *Not taking enough time to form well-researched (balanced) political opinions. *Playing small when I should be aiming higher. *Expecting more from some people than they are capable of giving. *Making foolish assumptions before I have gathered all the necessary information. *Putting up with people who make foolish assumptions before they have gathered all the necessary information. *Neglecting my feet when I moisturize. *Not taking time out to meet friends for coffee when Im invited because it’s easier to stay home in my pajamas and communicate via social media. *Dwelling on the mistakes Ive made. *Dwelling on the mistakes other people have made. *Apologizing for things that aren’t my fault. *Failing to notice — and apologize — when I am at fault. *Clinging to old stuff I need to pitch, which includes just about everything in the attic. *Forgetting to appreciate what Ive already accomplished. *Feeling guilty for reading the books I want to read instead of the ones on the neighborhood book club list. To access an earlier Lent reflection from my book, Writing Home, please click here. Charmed by the very idea of aromatherapy, I’ve always stored a few essential oils in my medicine cabinet. I sprinkle a few drops of lavender oil in my laundry, for instance, and rub eucalyptus oil on the walls of my shower when I’m congested. And when I have a rare moment to spoil myself, I book an aromatherapy massage at a nearby Aveda salon. Until recently, though, I wasn’t all that serious about studying the art and science of essential oils. Now, I’m becoming a convert. Last week I endured my first root canal, which was quickly followed by another emergency trip to Beaumont Hospital for my ailing mother. Just when I thought the medical gods couldn’t load another crisis on my plate of care-giving responsibilities … Well, let’s just say I’ve been feeling more exhausted than usual and more than a little sorry for myself. Of course, the endodontist prescribed an arsenal of antibiotics and pain meds to get me through a week of dental “discomfort.” But there wasn’t a pill to resupply the energy that my chronically ill mother has been draining from me. That said, I try to avoid most prescription drugs for the long term. Over the years I’ve learned that a healthy lifestyle is the best revenge — and if there’s a natural remedy for what ails me, I’ll reach for that first. After returning home from my root canal procedure, I opened the medicine cabinet and assembled a few essential oils on the counter. Almost instinctively, I went for the bergamot, lavender, rosemary, and eucalyptus oils. I sprinkled a few drops of each into the sink, which I’d filled with warm water. Then I dipped a facecloth into the mix, and gently pressed it to my nose and cheeks, taking deep breaths to inhale the heady mix of scents. The tension and tenderness in my sore cheek began to ease. Most important of all, I felt an undeniable shift in my gloomy mood. The scent of bergamot, reminiscent of an Italian orange grove, worked its healing magic. I felt uplifted. Doing some research online, I learned that bergamot is often used for relief from stress and depression. And I was surprised to read that lavender, which I typically use to scent laundry, is also beneficial for inflammation, wounds, headaches, and nervous tension. “Some of the healing that has taken place under their influence would be called miraculous if we didn’t have the scientific basis for explaining how essential oils work,” notes Valerie Ann Worwood in The Complete Book of Essential Oils & Aromatherapy. Worwood’s reference book comes highly recommended by most aromatherapy practitioners, and is a good place to start if you’re interested in the topic. If you really want to write, you will do it anywhere: under trees, on the bus, in the bathroom, or in a booth at a noisy cafe. First published in 1929, A Room of One’s Own by Virginia Woolf is often reduced to a catchphrase for writers and architects who have not even read the book. Originally penned as two lectures, Woolf’s landmark essay asserts that every woman writer should have a substantial income and a room of her own if she is to produce literature worthy of publication and readership. Furthermore, Woolf said, women who want to write ought to be given the freedom to travel and they must have plenty of idle time for daydreaming and creating. That was very progressive talk for the 1920s. And while it is not exactly earth shattering today, A Room of One’s Own is still considered a major milestone for women writers. Whenever I am asked to name 10 books that changed my life, this one never fails to top the list. Not surprisingly, the subject of finding or creating the perfect writing space” always comes up in the writing workshops I teach. Sadly, not having a room of one’s own is the most popular excuse for not writing anything. I have met a few self-described procrastinators who have an extra guest room, for instance, but insist they cannot work there because it is poorly lit, uninspiring, too small, too cluttered, too close to the neighbor’s window, or cursed with bad feng shui. But sooner or later, every serious writer arrives at this truth: If you really want to write, you will do it anywhere: under trees, on the bus, in the bathroom, or in a booth at a noisy cafe. Serious writers need only a pen and a notebook to get started. And nothing – not even a bad view or ugly curtains – will stop us. That said, I believe Virginia Woolf made an excellent point about the need for peace and privacy, and she did not even have kids to distract her. Working with little ones underfoot is another challenge entirely. When my own son was a toddler, I began freelancing in the damp basement of our 1920s home. If you are a younger parent who is eager to combine writing with motherhood and homemaking, setting up shop at a kids craft table next to the laundry room might sound convenient. But I quickly discovered this was not what Virginia had in mind. Working in a murky basement became a metaphor for the way I undervalued my career at the time. Aside from the fact that the ambiance was vaguely reminiscent of Freddy Krueger’s boiler room, my desk was typically littered with construction paper or my preschooler’s science experiments. Settling in to write, I would find blue finger paint or Play-Doh oozing from my paper-clip container. My scissors and rolls of tape mysteriously disappeared. Meanwhile, the clothes dryer kept buzzing, which did not exactly impress editors when I phoned to pitch stories. A year later, I moved my office upstairs to a sunroom with windows overlooking the yard. Not so coincidentally, I started taking my work seriously then. My writing became both a career and a vocation. I established a tighter writing schedule and contributed regularly to several local newspapers and national magazines. Two years ago, my husband generously agreed to renovate my office-sunroom, adding shelves and counter-top space for books, a printer, and office supplies. Most important of all, my home office has a glass door to help establish my boundaries. Every writer is different, so you will have to experiment until you find what works for you. Not long ago, I met a parenting columnist who was also the brave mother of four little boys. She could not afford to rent a class A office space so picked the cheap office space just ten minutes from her house, which seemed like a brilliant idea at the time. But after three months of commuting back and forth to work and trying to coordinate an awkward breast-feeding schedule, the columnist admitted her new office was not so ideal. The clamor of family life is what kept her energized and motivated. If you do not have the luxury of a spare bedroom or an attic with a desk, claim a corner of the house where you can focus on your work. Use the area just for writing (or your other creative projects) and keep supplies within easy reach. Put up a folding screen for privacy while you work; or use it to conceal your works-in-progress. Creating an official space for your creative life will dignify your goals and intentions. You will find it easier to follow a routine – and harder to keep making excuses. If you do not already have a room of your own, can you describe your ideal space – right down to the supplies you would need? What would you have to do to make it a reality? Note: Part of this essay is excerpted from a previously published essay “Home Sweet Office” â€” which appears in full in my book, Writing Home. 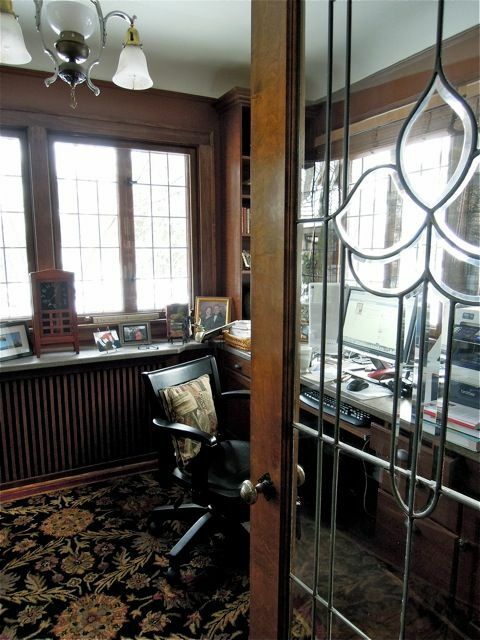 Top photo: a glimpse of my recently remodeled home office in Royal Oak.